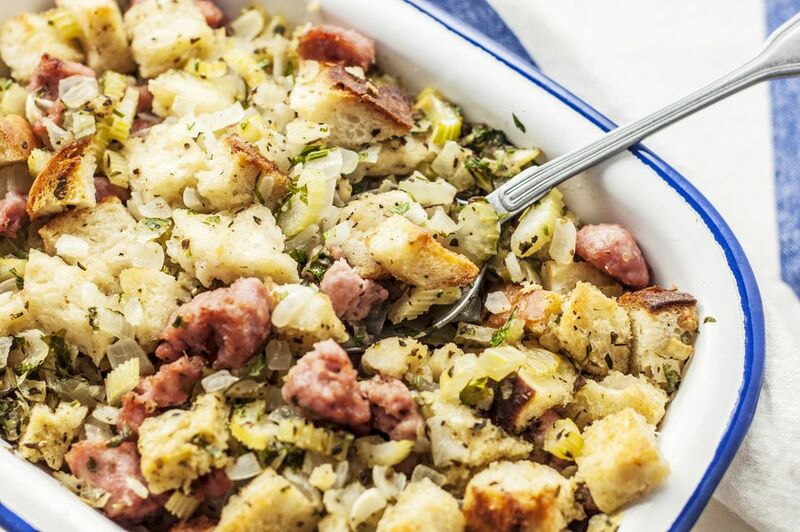 Sausage, onion, and celery give this seasoned bread dressing great flavor, the sausage adds extra moisture. Use fresh or canned chicken broth — preferably low sodium — in this recipe, along with fresh herbs if at all possible. Dried herbs are fine, too. This dressing is excellent with a roast turkey or turkey breast, and it goes well with a pork roast or a roasted or baked chicken dish as well. The dressing can also be used to stuff a turkey or chicken, but use a food thermometer to make sure it has reached the safe minimum temperature. Remove stuffing from the bird after the resting time and refrigerate it within 2 hours after cooking. The center of the stuffing must reach at least 165 F (74 C). Even if the turkey or chicken has reached the minimum temperature, it must be cooked until the stuffing is done. Lightly butter a 9-by-13-by-2-inch baking pan. Heat the oven to 350 F (180 C/Gas 4). In a large skillet over medium heat, cook the sausage, breaking it up and stirring frequently, until it is fully cooked and no longer pink. Remove the sausage to paper towels to drain. Wipe out the skillet with a paper towel and place it over medium-low heat. Add the butter and heat until it has melted. Add the chopped onion and celery and cook, stirring, until the vegetables have softened, about 5 to 7 minutes. In a large mixing bowl, toss the bread cubes with the herbs and seasonings. Add the vegetables with the butter and the drained sausage; then add the chicken broth and stir until well moistened, but not mushy. Pack gently into the prepared baking dish and cover it tightly with foil. Bake for 25 minutes. Remove the foil and broil for about 3 to 4 minutes, or just until browned on top. The stuffing may be made a day in advance. Cover and refrigerate overnight. Take it out of the refrigerator about 20 minutes before baking. Add 1 1/2 cups of chopped Granny Smith or Golden Delicious apples to the stuffing mixture. Add about 1/2 cup of dried cranberries, if desired. Add 1 grated or shredded carrot to the skillet along with the onion and celery.